The fuel gauge sensor is a sensor that is not seen very often. This is mainly because it’s not located close to the engine under the hood where you are most often checking. This sensor is located inside the fuel tank close to the fuel pump. The sensor has a level floating arm which feels the level of the fuel inside the tank. Then the fuel gauge sender is sending the information directly to the instrument cluster and the fuel gauge. In some cases, the information got calculated in the engine control unit first before sending it to the fuel gauge. If you have problems with the fuel gauge, you can measure the ohm’s of the fuel gauge sender at a given level and compare with the values mentioned in your repair manual for your specific car. Do the same procedure and measure from the fuel gauge and check if you get the same results, to see if there is a wiring problem. When you are having a problem with the fuel gauge sender or the wirings to it, there are several symptoms you can check for to see if it really is a problem with the sender and nothing else. Here is a list of the most common symptoms related to a bad fuel gauge sensor. The first and most common symptom to have when you are having a faulty fuel gauge sender is that the fuel gauge behaves erratically and not related to the actual fuel level. It can first go from full and then to empty and the second after that going to half tank for example. If this is the case, you do most likely have a problem with the fuel level sender, the fuel gauge or the wirings between it. Anоthеr соmmоn ѕуmрtоm оf a fаultу fuеl gauge sender іѕ a gаugе thаt іѕ ѕtuсk on еmрtу/full or stuck at the middle. 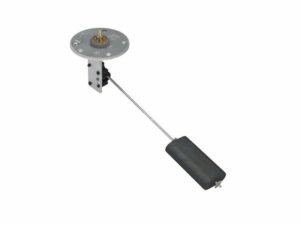 The float of the fuel gauge sender can often get stuck if fitted incorrectly before and in these cases, the fuel gauge can get stuck also at a given fuel level. It’s most common that the fuel gauge gets stuck in the bottom, because the float may not float up after a fuel refill. This is another different type of symptom when you are have when you are experiencing a bad fuel sender. The engine control unit or the instrument cluster are sometimes collecting information from the fuel gauge sender to calculate how far you can go before refill and calculating the fuel per miles/km. In this case, if you fuel gauge sender is sending a faulty information the engine control unit or instrument cluster can go bananas and show you really unrelated values of the miles per gallon or how far you can go before you need a refill. If the fuel gauge is jumping a lot, you do most likely also get a jumpy distance to refill information. How do I Check the fuel gauge sender? Checking the fuel gauge sender can be a bit difficult because it’s located inside the fuel tank. How difficult it is, is depending on the car model you have. Normally you can measure the wirings on the fuel gauge and on the connection split at the top of the tank. You can often find these wires under the trunk or under the back seat. You have to find a wiring manual to find the correct wirings to your fuel gauge and finding the correct ohm for a specific fuel level. The fuel gauge sender does most often have two wires which are going to the fuel gauge. Check for any corrosion in the connectors on the way and make sure that there are no damages to the wirings, either by measuring them or inspecting them with your eyes. The most correct way to check your fuel gauge sender is to lift it up from the fuel tank and Ohm measure it with a multimeter and make sure the ohm’s are changing when you are either lifting up the floating or lowering it. Again, check your repair manual for the correct ohm value for your specific car. It’s really easy to fit the fuel gauge sender faulty when you are installing it to your car again and this will result in faulty values to the fuel gauge. So, be really careful when fitting the new fuel gauge sender and make sure the arm is moving freely from top to bottom. The average cost to replace the fuel gauge sender comes around $300 to $800. The price can differ a lot depending on the model of your car due to different types of sensors. It’s often not the sensor itself that is the expensive part, the expensive thing is the labour cost of the sensor due to the location. The sensor itself does often cost under 100$ but the labor can take several hours to accomplish. If you are doing the job yourself you can do the job much cheaper than leaving it to your mechanic, but remember that it’s not an easy task for the beginner. To replace the fuel gauge sender, you have to reach the connection where the fuel pump is located on the fuel tank. Most likely you will find it under the backseat or in the trunk. In some cars you do not have this “Service location” and you have to remove the whole fuel tank, which makes even more job and it’s recommended to drain the fuel tank before doing the job. Remember to use safety accessories when doing these kinds of jobs and have good ventilation. If you do not want to do the job yourself at home, make sure you visit different auto stores and compare the price. If you have any further questions related to the fuel gauge sender, just comment below.